In Montessori when is it OK to correct your child? "I had read your guidelines for presentations and there is something that is not clear for me. What does '"Control of Error: Visual Discrimination'" mean [regarding the Pink Tower]? When should I correct my son? As soon he chooses the incorrect [Pink Tower] block? Should I wait until he has finished? What should I say to him? Or Should he note the error by himself? In general, I have this problem in many activities. For example, today he did (very well) color discrimination (with color sticks instead of color tablets). At the beginning he tried (one or two times) to put the stick in the incorrect place and said “same color” and he put the stick in the correct place. It worked well for the purpose of the exercise but I am always concerned to not interfere." Interfering and correcting! Great question! 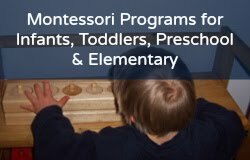 Typically, in a Montessori preschool classroom, the adult does not correct the child while they are working with a material. Sometimes it is necessary if they are holding a pencil incorrectly, or a pair of scissors. 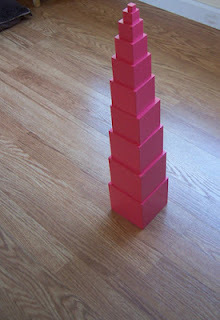 Many of the Montessori materials are self correcting (like the geometric cabinet), or there is a "control of error" meaning when a child makes an error, it can be noticed (eventually by the child) visually, and thus corrected. With the Pink Tower, the cubes are stacked from largest to smallest. When the cubes are not stacked correctly, it can be seen (visual discrimination) and corrected by the child. I know it is hard to watch when your child makes a mistake and not jump in to correct it! Give it time, allow the child to make mistakes, that is how they learn. But if you think it is necessary, you can represent an activity the next day (give another lesson). You also want your child to come to you for help, and not the other way around! So if you see that they are struggling, don't jump in right away! This morning my son finished a floor puzzle and was trying to put the lid back on. This is hard even for an adult sometimes as the box lids can be very tight! I had to hold back from helping him, he kept struggling and trying over and over, I felt impatient! How much easier it would be if I could just help him a tiny bit! OK, I tried to help him, he wouldn't let me! "No, mama, I do it!" And sure enough, after ten tries, he did it. And I know he felt proud! So even I'm guilty of stepping in when I'm not needed (or invited)! It is also true my son will come to me for help, especially if it is at the end of the day and he is tired. So try to hold back and not correct your child. I know it's hard! And if you absolutely have to step in, say, "Can I have a turn?" If he says no, then respect that.